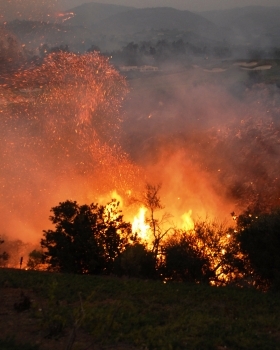 A recent study of one of California's most devastating wildland fires by the National Institute of Standards and Technology (NIST) and the U.S. Forest Service (USFS) strongly suggests that measures for reducing structural damage and property loss from wildland urban interface (WUI)* fires are most effective when they are based on accurate assessments of exposure risks both for individual structures and the community as a whole. The report also describes how the NIST-USFS WUI Hazard Scale provides a state-of-the-art tool for making such assessments and how that data could be linked to improved building codes, standards and practices that will help communities better resist the threat of wildfires. 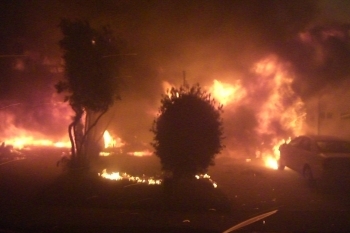 Over 46 million residential structures in the United States are in areas at risk of wildfires. A new publication* from the National Institute of Standards and Technology (NIST) identifies a set of research needs aimed at preventing or managing this growing threat to about 70,000 communities located in the so-called wildland-urban interface (WUI). improving the understanding of "how vegetation, topography, climate and construction cause structure ignition and spread of fires."